Drastic step or careless move? IN YET another attempt to save regional rural banks from collapse, the government intends to take private parties on board. 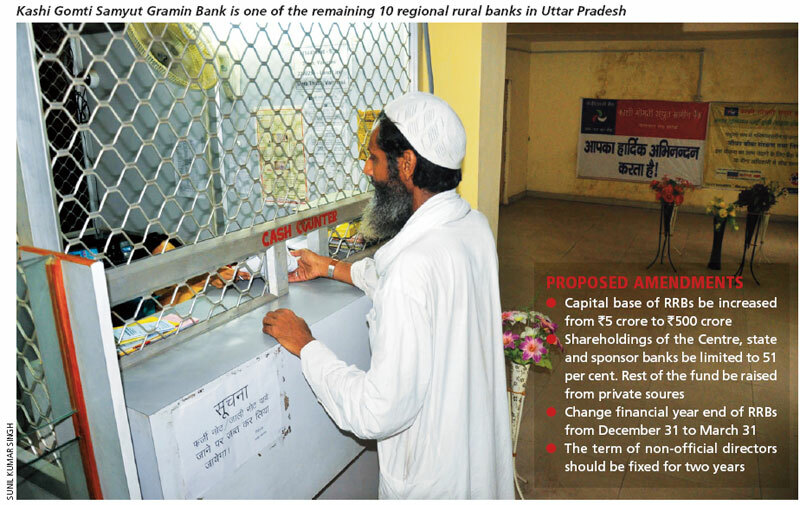 In the recently concluded budget session of Parliament, the finance ministry tabled a Bill that allows regional rural banks (RRB), also known as gramin banks, to raise capital from private sources. Analysts are skeptical. They say private shareholding may ensure financial stability but would distract RRBs from their objective of strengthening rural economy. RRBs were set up in 1975 to ensure banking and institutional credit facility to those engaged in the agriculture sector and cottage industries. It is jointly owned by the Centre, the state government and some designated commercial banks, called sponsor banks, who fund its capital base in the proportion of 50 per cent, 15 per cent and 35 per cent, respectively. But RRB could never become a profitable venture. In fact, most RRBs were saddled with bad loan within five years of inception. The Regional Rural Banks Amendment Bill, 2013, aims to infuse vigour into RRBs by increasing their capital base from `5 crore to `500 crore. But the capital would no longer be entirely borne by the Centre, concerned state government and sponsor bank. Their shareholdings would be limited to 51 per cent and the rest would be raised from private investors, according to the bill draft (see ‘Proposed amendments’). If this provision sails through Parliament, it will push RRBs towards privatisation, alleges Sayeed Khan, general secretary of All India Regional Rural Bank Employee Association. Khan questions the need for private investment at a time when the government has already taken measures to revive the banks, though after 25 long years. Since the inception of RRBS, the government has appointed at least 10 expert committees to analyse their financials and suggest measures to revive them (see ‘Ignored for long’ on p10). Most committees recommended merger of the loss-making RRBs either with neighbouring viable RRBs or with their sponsor banks. Some also recommended their liquidation. But the government did not act until 2005. That year, the government began consolidating loss-making RRBs with the profit-making ones to make them economically viable. By April 2013 there were just 62 RRBs from 196 in 2004 (see tables on p10). In the next couple of years, following the recommendation of the panel headed by K C Chakrabarty, deputy governor of the Reserve Bank of India, the government increased the capital inflow of 40 loss-making RRBs. Chakrabarty panel had recommended that the Centre, the state governments and sponsor banks should release `2,200 crore to bail out these banks. The impact of this capital infusion has begun showing on the ground. The latest RBI report shows there have been improvements in credit flow to rural areas. In 2010, the loans disbursed for agriculture, including crop loans, agriculture and allied activities, was `46,282 crore. The loan amount increased to `55,067 crore in 2011. The disbursement of non- agriculture loans increased from `36,537 crore to `45,231 during the period. Going by the performance, is there still need for private investment? Biswa Swarup Misra, an economist and banking expert, blames the stakeholders of RRB for its poor performance. In 2007, Misra presented a paper on the performance of RRBs to the Reserve Bank of India. “RRBs could have done better had sponsor banks played a proactive role in guiding them and state governments provided conducive banking environment,” says Misra. In 2004, more than half of the loss-making RRBs were in four states—Bihar, Madhya Pradesh, Maharashtra and Odisha. These states neither provided proper infrastructure nor managerial skills to RRBs, Misra says. Besides, sponsor banks often open branches in areas where RRBs operate. “This creates conflict of interest,” says Khan. As sponsor banks approach the same set of customers which RRBs have been serving since inception, they act as competitors. Sponsor banks also do not share the profit generated through loan interest, which affects RRBs’ financial conditions, he adds. Khan demands that RRBs be placed under an independent body like National Bank for Agriculture and Rural Development (NABARD) where they do not have to face competition. In 1998, M Narsimhan, former governor of RBI, had pointed out that RRBs had not been able to earn much profit because of limited operation area and target groups. “The salary structure of RRB staff is not motivating enough,” points out B K Swain, head of the Centre for Rural Credit and Development Banking at the National Institute of Rural Development in Hyderabad. The long list of defaulters shows lack of commercial orientation of RRBs, he adds. Swain, however, favours private investment. Even after consolidations, there are 40 RRBs which are considered weak, he says. N K Thingalaya, economist and former managing director of Syndicate Bank, says RRBs can be made viable without private investment. Syndicate Bank is a prominent sponsor bank of RRBs. “Instead of raising finance from private sources, the staff of RRBs should be encouraged to become shareholders of their respective banks,” he suggests. Y C Nanda, former chairperson of NABARD, says consolidation of RRBs has affected its local feel and role. Private shareholding would lead to further exclusion of rural beneficiaries. “I am aware of the poor performance of RRBs. But the point is we are going away from the objectives for which RRBs were established,” he adds.